West Liberty-Salem senior track standout Kam Evans finished his track career at Jesse Owens Stadium at The Ohio State University on Saturday morning in the 300H final. Evans finished in 3rd place with a time of 39.70 secnds. Chad Zallow of Warren JFK won the event (39.06), and Caleb Moore of Shenandoah High School was second (39.57). 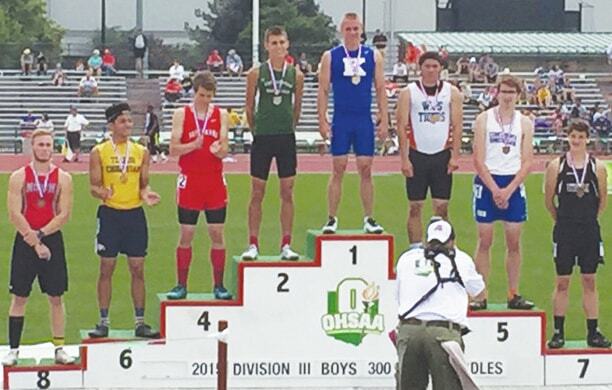 Evans finishes his track career with a 1st, 3rd, and 5th place medal from the state meet (2014 and 2015 season). Kam finished in first place 25 times and scored 381 points for the WL-S track team during the 2015 season.